A Queens Assembly Member who once wanted all cyclists to carry a license just like drivers now wants to enforce bike lanes with summons-issuing cameras — but some bike riders familiar with the pol’s previous attitude towards cyclists are suspicious if the bill is really a secretive move to harass the riding public. 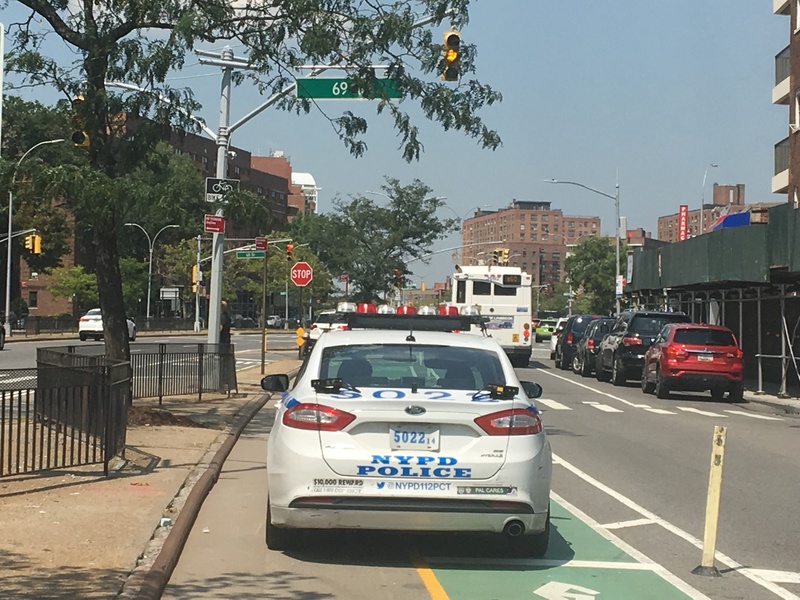 Assembly Member Michael DenDekker said he introduced bill A6674 — which calls for camera enforcement to keep drivers out of protected bike lanes — after seeing cars and trucks in his western Queens district endangering cyclists by swerving into the new Queens Boulevard bike lane. The program would start out as a pilot with just 50 cameras placed in protected bike lanes throughout the five boroughs, said DenDekker, but that number could be increased each year. Cars caught in a protected bike lane would get a ticket, likely similar to the one motorists get for driving in a bus lane, which is about $115-$150, said DenDekker. So cycling advocates are naturally wary of DenDekker’s new bill. And other cyclists pointed out the bill’s use of the word “vehicles” instead of “motor vehicles” suggests that DenDekker’s camera enforcement program would apply to 50-pound, unmotorized bicycles as well as 3,000-pound cars and 10,000-pound trucks. “That would be something that would be need to cleared up, the language for owner of motor vehicle,” said Eric McClure of StreetsPAC, the political action committee. But DenDekker said the bill he wrote eight years ago and the one he introduced last week are entirely different, and he’s not trying to sneak one past cyclists. In fact, he said he’s willing to amend the language to further protect cyclists. DenDekker also pledged not to reintroduce legislation requiring licenses for cyclists, according to his spokesman. “I can unequivocally say that the issue with the withdrawn bill was resolved and that he has no intention of revisiting or reintroducing that legislation,” said George Hadjiconstantinou. “Right now, our office is focused on keeping cars and trucks out of bicycles lanes. The Department of Transportation did not immediately respond to a request for comment. If this guy has experienced a genuine change of heart, we should applaud this. Maybe he could be the catalyst for similar growth in some of his colleagues. My guess is either him or people he knows started riding bikes. Now he finally realizes the enforcement priorities need to focus on motor vehicles, not cyclists. Regardless of the reason, if there’s no ulterior motive he can be a great ally. I have no business in queens, but if there’s a camera enforced protected bike lane put in, I’m going to ride on it, just to enjoy that notion. No, the play here is simple. Driver sees cyclists veering into traffic. Thinks, “There oughtta be a law…” Sees that drivers are parking and driving in lanes. Figures he can’t call for a crackdown on cyclists outside of their bike lanes until the bike lanes are clear. Advocates continue to be blind to the ways that our bike-lane-required laws facilitate harassment of cyclists. I have watched my Assembly Member over the years morph into a much better human being and definitly seems more genuine about street safety of late. Still, I agree, we should be careful and make sure this is what it seems. Frankly, I would love to have these cameras just put up and down the large protected bike lanes of Manhattan as an initial experiment. What is “riding in a manner which is accustomed to the lane”? DOT's design for the Queens Boulevard capital project calls for placing the bike lane on a mountable curb, which would do little to prevent incidents like this.